A long-running electronic duo records an organic-sounding album dedicated to one of their earliest influences…Last year, that could win you an armful of Grammy Awards. 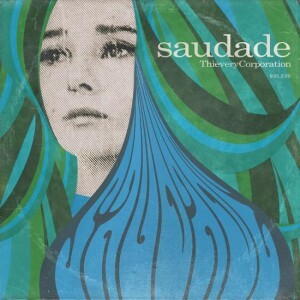 Thievery Corporation are not likely headed in that direction, but Saudade does gently urge us to lose ourselves to samba. Usually, Eric Hilton & Rob Garza‘s lounge music trots the globe, from their native Washington D.C. to the Caribbean to the Middle East. Named after a Portuguese term for “deep melancholic nostalgia,” Saudade is primarily a South American affair. What these thirteen Latin guitar/rim click/hi-hat/breathy female vocalist compositions lack in surprise, they make up for with passion. Longtime collaborator Lou Lou Ghelichkhani goes Astrud Gilberto en français on “Decollage” and makes us wonder “whatever happened to The Bird and The Bee?” on “Firelight.” Shana Halligan of Bitter:Sweet nails the 60’s film soundtrack vibe on “Depth of My Soul.” After thirty minutes of leisure, the mid-tempo “Para Sempre (featuring Elin Melgarejo)” feels like a four-on-the-floor moment. A mutual love of bossa nova first brought Thievery Corporation together in 1995, and Saudade is a lushly produced ode to both that genre and their partnership.